BRASILIA, Sept 13, 2011 (AFP) - The emerging economies of Brazil, Russia, India, China and South Africa will discuss possible aid to the European Union amid its debt crisis, Brazilian Finance Minister Guido Mantega said Tuesday. Mantega and his counterparts from around the world will be in the US capital next week for the annual meetings of the International Monetary Fund and World Bank. "The BRICS nations will meet next week in Washington and we will discuss how to help the European Union get out of this situation," Mantega said, of the five-strong bloc, whose meeting is set for September 22. 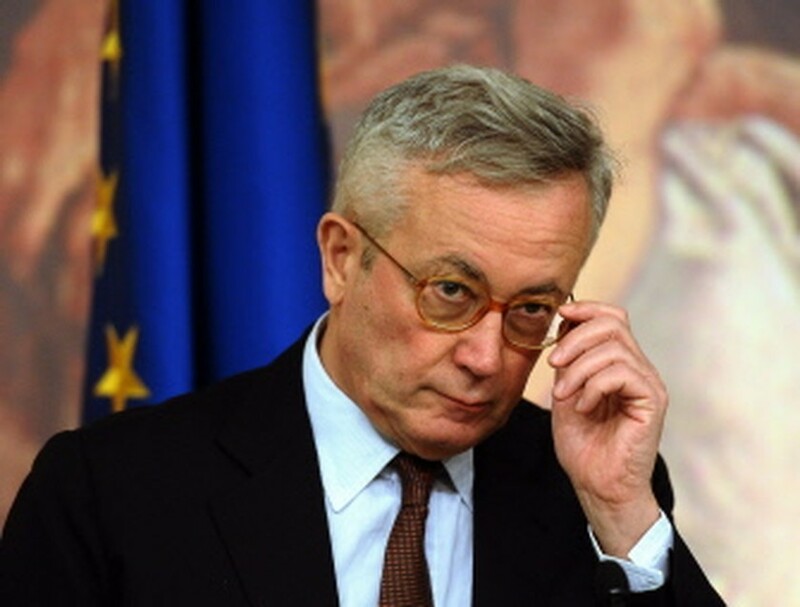 AFP - (FILES) A file photo taken on August 12, 2011 shows Italian Finance Minister Giulio Tremonti gesturing during a press conference in Rome ahead of a cabinet meeting called for the adoption of a new austerity program. In what would be a reversal of roles, the leading emerging economies, which in recent years have been growing faster than the major industrialized nations, were expected to propose a plan to help stabilize the global economy and markets, according to the Brazilian financial daily Valor. The report said one idea being floated is to increase the reserves of the emerging markets of their assets in euros, in an effort to ease the debt crisis in the eurozone. According to Valor, the BRICS would be keen to show their importance in worldwide economic stability while improving returns on their reserves with the European securities. The news came with markets roiled by the debt crisis in Greece and other eurozone nations and EU officials pushing a second bailout for Athens. At the same time, China and some other emerging nations are sitting on huge international reserves. Valor said the BRICS nations at this point would be prepared to boost holdings in only the most solid eurozone nations such as Germany, and could also invest in bonds issued by Britain, a non-eurozone country. The proposal for the BRICS to help during the crisis "makes a lot of sense," although it would have a limited impact, according to Alex Agostini, chief economist at Brazilian risk analysis firm Austin Rating. "Everyone has to be involved in looking for solutions because the economy is globalized and the crisis has negative effects in all countries," Agostini told AFP. The proposal "could help to temporarily reduce this moment of volatility but it won't resolve the problem," he added. The BRICS could also help Europe by using their sovereign funds to invest in European financial or production sectors, Agostini suggested. Separately on Tuesday, Germany, France and debt-mired Greece agreed to hold a fresh round of talks on the euro crisis after US President Barack Obama urged Europeans to make greater efforts to calm volatile markets. Italy, meanwhile, admitted that its finance minister met with the head of China's largest sovereign wealth fund CIC last week as Rome tries to bring down soaring borrowing interest rates. According to the Financial Times, the talks addressed the possibility of China buying Italian bonds, a move Rome hopes will reassure skittish markets. Italy denied the report but indicated it was discussing possible investments with China, particularly in the industrial sector. Italy has tried to reassure investors by announcing a new austerity package in August which should see the country balance its budget by 2013.